Paul and Natalie cleaned my living room carpet that had a continual large area stain that kept coming back after other companies cleaned. Ureka! The stain has not returned. They were very professional and down to earth team. I will have them back and highly recommend! It had been too many years since we last had our carpets cleaned & honestly, I didn’t hold out much hope that a variety of spots, stains & heavy traffic areas could be restored. I was very, very pleased that after the cleaning our carpets look fabulous! The difference is amazing. Paul & Natalie were timely & efficient, yet very effective at what they undertook to do. They answered all my questions, give some good advice & suggestions and then “got after it” producing fantastic results. Paul even detected some cat urine odor evidence that I guess I had just become used to. The PURT product did the trick in neutralizing the smell. Paul was my technician. He was friendly and came pretty close to when they said someone would be there. He was accommodating (I had a rug and two rooms cleaned instead of 3 bedrooms). He did a great job on the rooms and got out all the spots my kids made with food and who knows what else. I would go through them again. Chem Dry has been cleaning our personal home and rental apartments for several years, and I have always had complete satisfaction with their cleaning services and professionalism. On several occasions a stained reappeared and they came back promptly to take care of it. Recently, I spilled a plant with soiled water on our carpet. I was convinced that this was going to be permanent, since it penetrated the pad down to the flooring. Paul, the owner at Chem Dry, said that there’s a good chance it will come out, but it might take a treatment or two (at no additional cost). True to their word they needed to come out on two additional trips to get the stain out. I have always been impressed with their professionalism, commitment to their word and reliability; I highly recommend them. 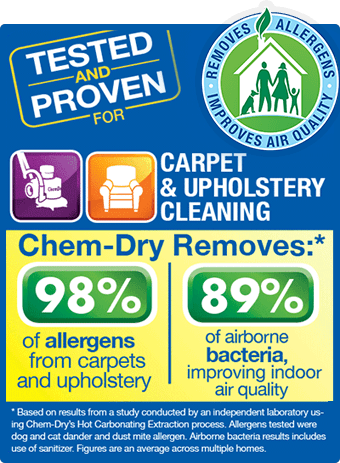 Very nice tech, upfront and honest, carpets look great and pet issues totally remediated. Would recommend them and will use them again. Three (3) area minimum. Up to 120 sq ft. per area. Hot Carbonating Extraction Truck-Mount Cleaning Method. 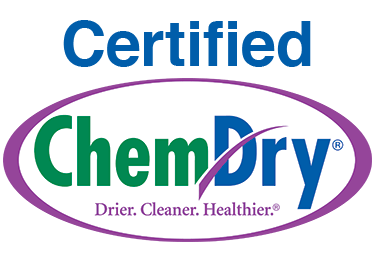 Expires 05/04/19 Call Certified Chem-Dry at (801) 266-1149.